CLEVELAND, Ohio -- A day in the life of the man pretending to be Sheriff Lucas Hood includes a rebellious teenage daughter; daily contact with an estranged former lover who happens to be her mother; two of the town's most powerful men breathing down his neck; and a never-ending penchant to find the next big heist. What would his life be without conflict?? 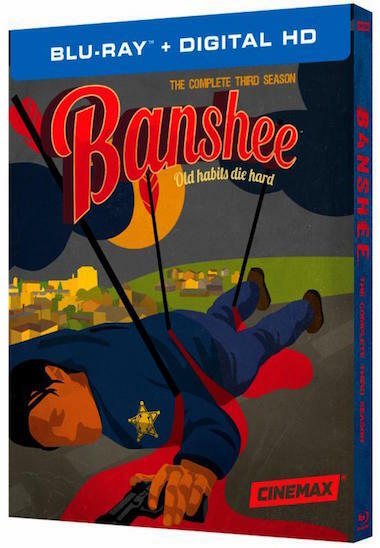 Well, Season 3 of "Banshee" won't offer an answer to that question, but it will offer a roller coaster ride of high-action drama. Kai Proctor (Ulrich Thomsen) is still at odds with Lucas, but he's recently learned that his devoutly Amish mother is dying of pancreatic cancer, and takes her to the hospital -- of which his father disapproves. For years now, Kai has been shunned by his father and the rest of their Amish community. Rebecca (Lili Simmons), who's on the fast track to learning the ways of Kai's 'business dealings,' is being stalked by Chayton Littlestone (Geno Segers) and his cronies. During the investigation of the violent murder of four marines by Littlestone, Lucas gets wind of an operation on a local military base that could be one last big payday for himself, Sugar (Frankie Faison) and the rest of his robbery gang -- if only he can convince Job (Hoon Lee) to participate. Job left town and wants nothing more to do with Banshee, PA.
For months now, Carrie (Ivana Milicevic) has been 'hanging out' with Col. Douglas Stowe (Langley Kirkwood), the person in charge at the military base. Lucas sees this as a conflict of interest. Will Carrie's feelings for Stowe cloud her judgment? Season 3, which goes the extra mile with a more cinematic feel and cleverly shot, intricate stunts, includes what could be considered the mother lode of bonus content, such as a behind-the-scenes look at the choreography created for the no-holds-barred battle between Clay Burton (Matthew Rauch) and Nola Longshadow (Odette Annable) in Episode 3; the specially-created opening sequence for Episode 2; the multi-camera, interactive feature detailing "The Heist"; and Zoomed In featurettes for 9 of the 10 episodes.